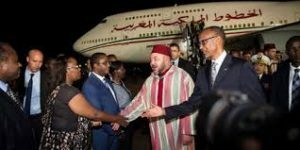 The historic visit King Mohammed VI started Tuesday to Rwanda has been crowned by the signing of 19 cooperation accords aimed at boosting bilateral ties in almost all strategic sectors. The signing ceremony was chaired by the Moroccan Sovereign and President Paul Kagame during the 2nd day of the three-day state royal visit to the African country. In this regard, Cooper Pharma, a leading Moroccan pharmaceutical company, unveiled a project to build a plant in Rwanda to manufacture antibiotics. The drugs that will be locally produced include beta-lactam antibiotics, which are among the most commonly prescribed drugs, including Penicillins, grouped together upon a shared structural feature, the beta-lactam ring. The plant, to be operational in 2019, will be built on a plot of 10,000 square meters in the Kigali Special Economic Zone in Gasabo District. For its part, Moroccan Attijjariwafa Bank signed an agreement to buy 75 pc of the stake of Rwandan bank Compagnie Générale de Banque Limited (Cogebanque) for about $ 41 million. Cogebanque is Rwanda’s third largest bank by assets, which totalled $226 million at the end of the third quarter of 2015, while Attijariwafa Bank has been expanding in Africa. It has subsidiaries in Tunisia, Côte d’Ivoire, Senegal, and Mali, among other countries. Another Moroccan leading bank, BMCE Bank, which is chaired by Othman Benjelloun and which is active in some 20 African countries, will participate in a low-cost housing project in capital Kigali. Morocco’s Palmeraie Développement and the Development Bank of Rwanda will participate in the project providing for the construction of 5,000 low-cost lodgings. After Rwanda , King Mohammed VI will visit Ethiopia and Tanzania in his first tour in this part of Africa. Written by: Jaber Ali on October 20, 2016. Posted by Jaber Ali on Oct 20 2016. Filed under Headlines, World News. You can follow any responses to this entry through the RSS 2.0. Both comments and pings are currently closed.